Wedding photography at the Breckenridge Nordic Center by Colorado wedding and engagement photographer Mark Creery. 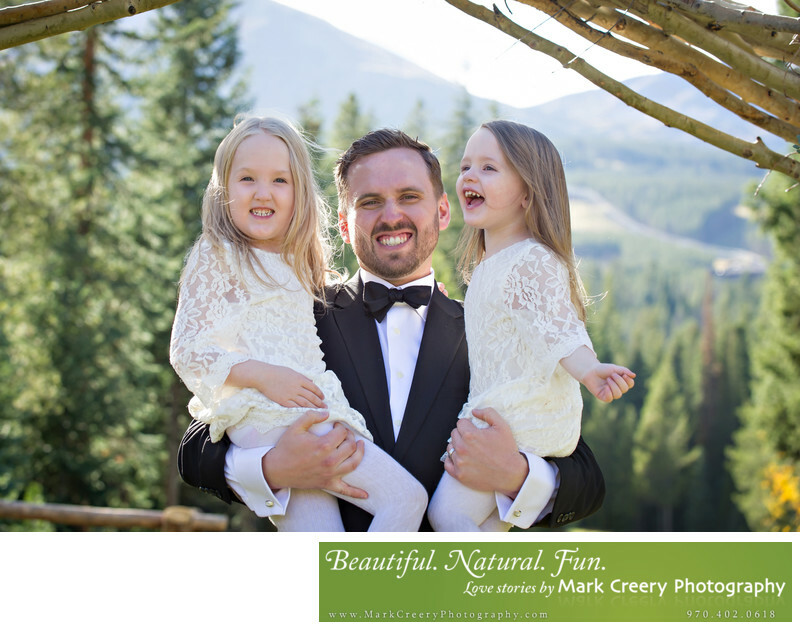 Mark has experience photographing weddings at the Nordic Center and can highlight the scenery the area has to offer while still showcasing your personalities. He loves outdoor photography and his couples are fun, adventurous and laid-back, which is why Breckenridge is the perfect place for weddings. If you're looking for a wedding photographer check out more of Mark's work and get in touch. This photo was taken after ceremony at the Nordic Center under their attractive arch feature, facing Breckenridge Mountain in the background. The groom is holding his two daughters, who were the cutest flower girls ever. You can see the pure joy in each of their expressions, which are the true emotions that I strive to capture on a wedding day. Because of my photo journalistic approach to weddings, I don't interrupt moments like these. Standing back and letting real expressions unfold in front of me by not imposing myself on the moment is my key to success. This comes from years of weddings experience and knowing when to give instructions and when to keep quiet. This wedding was really a perfect union with perfect weather to boot! Breckenridge Nordic Center is located on Ski Hill Road in Breckenridge, Colorado. Contact: (970) 453-6855, BestNordicSki@gmail.com. Location: Breckenridge Nordic Center 9 Grandview Drive Breckenridge, CO 80424.